In the late afternoon today, 26th January 2016, our national coordinator Aldo Milani was taken away by the police, arrested and transferred to jail in Modena and, even now [in the early hours of January 27th - Ed. ], his legal defence has not been enabled to contact him. It’s clear that we find ourselves in front of an unprecedented repressive escalation: the bosses’ state, unable to stop the struggle with sackings, threats, hundreds of charges, expulsion orders, baton attacks and tear gas that in recent years has blown the lid off the cesspool of exploitation in logistics and the deep system of collusion and complicity between bosses, institutions and cooperative1 systems, now seeks to stop anyone who has dared disturb the those driving that system. After the laws killing workers’ rights, after the reduction of wages to misery, what workers had won up to now with their blood, sweat and tears is being put in the sights of an immediate repression that seeks to strike whoever dares rebel and, above all, dares practice a political action that goes within the tradition of liberation from wage slavery. The repressive plan wants to divert attention from the situation of exploitation experienced by the world of work and the logistics sector in particular: against this barbarism a movement of struggles has risen that, in recent years, has no equal in the toughness of the forms of struggle nor for results achieved. 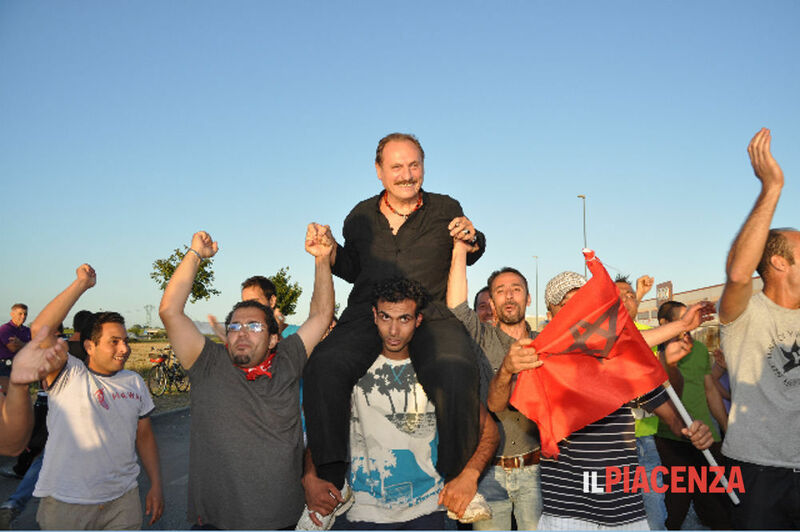 The substance is simple: with the arrest of Aldo Milani they want to outlaw the right to strike! If the class enemy deludes itself that it’s able to free itself of SI Cobas, the managing class are mistaken big time! To this full-frontal political attack we will respond immediately with the only weapon that workers have at their disposition: self-organisation and struggle. From now we are calling a mobilisation in all workplaces, and we call the networks of sympathisers to mobilise for the initiatives that will be called by SI Cobas in the coming hours against repression and for the immediate release of Aldo. Other statements will follow as soon as we have updates. 1. In Italy, a ‘cooperativa’ is the name given to companies that have taken work contracted out by a parent company. It has nothing to do with ‘cooperative’ working or workers’ co-ops. Tweets below show video and photos from solidarity strikes: workers at Sogetras sites in Bologna and Peschiera Borromeo (near Milan) and at SDA and DHL in Carpiano (also near Milan). Fermi anche alla #sogetras di #Bologna e alla #Dhl di Carpiano. They say Aldo and a union consultant have been caught during a proletarian fundraiser for the unions strike fund. Not had time to translate this one but here's the latest SI Cobas press release, When the proletariat asks for a fair salary, they're 'extorting'.. Briefly, they're saying this is a police/bosses fit up, that the guy supposedly 'with' Aldo (in the incriminating video) is actually a labour consultant nothing to do with SI Cobas (they specify that he's from "the bosses' world not the union world") and that Aldo is completely separate from the 'passing of the envelope' (which occurs between company person and this labour consultant)..
Hopefully get a chance to write more later..
Yep, SI Cobas claims, that it was a fit-up by the police / the bosses and that the second person was placed next to Aldo by the bosses during negotiations following the sacking of 52 workers. They say it is an attempt of Levoni to distract people from their crimes against the workers and in order to dicredit the union. Updates via USI and Infoaut facebook pages: looks like Aldo has been released with the judge saying that he was not connected to the things for which he was arrested on 26 Jan.